Fatma is an Egyptian businesswoman with high ambitions. Together with her four employees, who are also her sisters, she makes wedding dresses at her workshop. 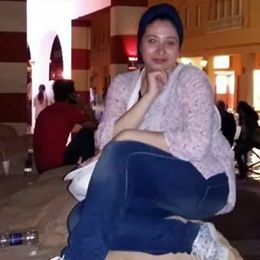 She has markets in Alexandria and in Cairo and advertises her dresses through social media. Her Facebook page has over eight-hundred likes! Fatma had a few concerns about how to grow her business and turned to HANDS Young Entrepreneurs Program for some guidance. The Young Entrepreneurs Program is designed to spur entrepreneurship among the most energetic segment of the Egyptian population: the youth. So far, HANDS has instructed over one-hundred and sixty young entrepreneurs! In addition to having provided in-person training sessions in Egypt and in the U.S., we now also offer the option for Egyptian entrepreneurs to connect with American-based experts online! Fatma took advantage of this great opportunity to ask questions related to expanding her own business. Some of Fatma’s main concerns included gaining more experience, attracting a larger audience, and employing more girls. Aside from helping other women in her community economically, Fatma aspires to empower them and set an example that anything is possible with a lot of hard work and effort! After attending one of HANDS’ online workshops designed to connect young people with the training and education necessary to turn their ideas into commercial enterprises, Fatma now feels ready to conquer her dream of expanding her wedding dress business one step at a time – – and perhaps more importantly of empowering Egyptian women in her community. In addition to the practical experience that our participants receive in the field of business administration, the Young Entrepreneurs Program also seeks to engage young people in intercultural interaction. We would like to thank the American embassy in Egypt as well as our HANDS donors, for without their generous support, this great program would not be possible! No Comments to "Going virtual! HANDS launches online training program for Egyptian entrepreneurs"